2 bedroom luxury apartment, sleeps 5, balconies magnificent sea view. Number 20 Nautilus is a duplex apartments in a luxury development of 28 contemporary apartments adjacent to a magnificent sandy beach at Westward Ho! This holiday apartment is owned and furnished by the architect. In 2005 the building won the only Royal Institute of British Architects annual award for architecture in Devon and Cornwall. It has been featured in numerous publications. The apartment is exceptionally spacious, the sculptured roof creates an exciting interior with huge windows to make the most of the sea view. There are three balconies including an external sea facing terrace on the living level with table and chairs for 'al fresco' dining and to enjoy the magnificent sea view and sunsets. The apartment interior has been repainted, May 2016 to maintain the fresh modern design. Golf course 5 minute drive, approx. 10 min walk. : This is The Royal North Devon Golf Club which is the oldest golf course in England and very attractive. Entertainment for children: There is plenty to keep children amused, the apartment is fully equipped for families including WiFi, DVD, digital T.V., board games, next door to Nautilus there is a free indoor soft play zone. Nearby there are many local attractions such as Big Sheep theme park(approx.5 - 10 mins drive), The Milky Way Adventure Park, Combe Martin Wildlife and Dinosaur Park, Lundy Island Marine Nature Reserve (by boat), RHS Rosemoor Gardens, Tepely Park and Arlington House (National Trust properties). For those who enjoy cycling you can hire bikes in Instow or Bideford to explore the Tarka Trail. Westward Ho! is full of beach activities for children and horse riding on the beach is also possible. Appledore is an attractive fishing village 10 mins away. There is a fast coastal road for access to the magnificent North Devon coast Woolacombe, Croyde, Braunton,Saunton, Clovely and Bude in Cornwall. 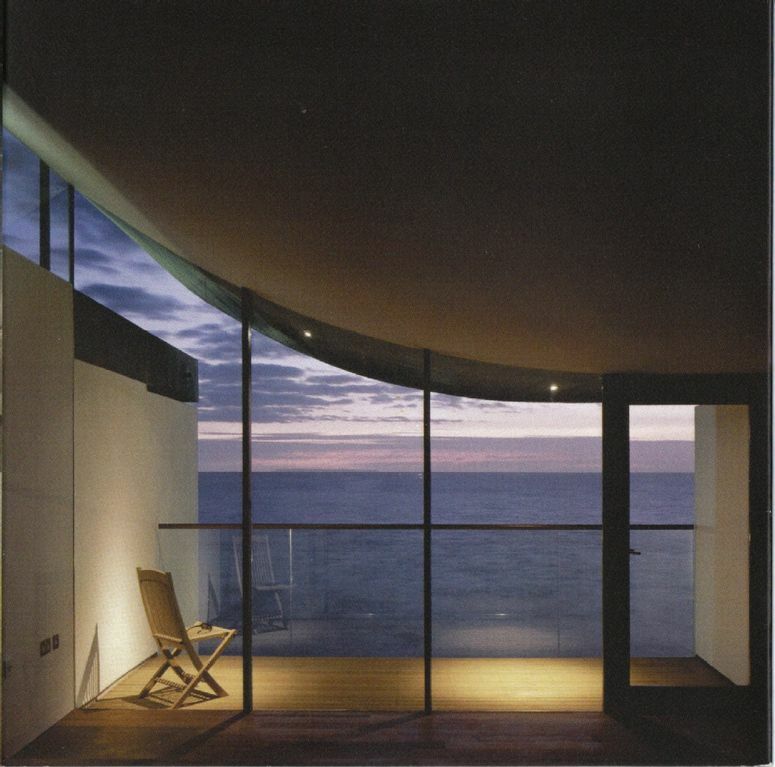 My husband, Architect Guy Greenfield designed Nautilus Apartments and won the RIBA award for this building in 2005. I am an artist and enjoy the inspiring sea views, our two children love staying at 20 Nautilus, being so close to the beach, convenient for the town, there is always plenty to do and we all enjoy the amazing sunsets. Amazing position, across the road from the beach. Outstanding sea views. In the centre of the town restaurants, Pubs and shops only a few minutes walk. Interior designed by the architect. 20 Nautilus is in the centre of the development and therefore has the best, uninterrupted sea views. 2 parking spaces per apartment in the private parking close to the front door of the apartment. Open plan with spectacular sea view. Golf course 5 to 10 mins drive. There are two flights of stairs which would make the apartment unsuitable for wheelchair access and severely disabled visitors. However there are handrails on the stairs. The apartment is ideally positioned with superb views of Westward Ho! beach. It is well equipped and the modern, open plan design creates a bright and roomy environment. The front and rear balconies provide outdoor space that can be used even when the weather is not at its best. I'm sure we will return. Amazingly functional property with great bedroom space and exciting top studio space to bring the family together. We all enjoyed the fact that we were on the doorstep to the beach with no need to worry about driving anywhere for the duration as shops were conveniently at hand too. Soothing sound of the sea and waves at night, and sitting on the balcony with the calming candles was an added bonus that made the money feel well spent on a feeling you cannot often buy. Has everything you need for self catering and was a welcome retreat that we'd definitely recommend coming back to again. We really enjoyed our stay at Nautilus apartment and the convenience of the location helped us to all relax immediately. Everything we needed was available and we enjoyed exploring the area and discovering some beautiful beaches and local restaurants. Thanks and we hope to return very soon. We are so glad you enjoyed returning to our apartment for another 2 week holiday this year. We look forward to you staying again. Many Thanks. I’ve stayed there for many years love it very much always have a lovely holiday there lots of memories time . So glad you enjoyed your holiday. Thank you. Fantastic spot for a family holiday. We've been in the sea almost every day even though it is the October half term. We loved the open plan living and watching the sea what ever the weather. No wonder there is an exclamation mark. Great afternoon tea at the Tea on the Green followed by an atmospheric Day of the Dead carnival through the town. Thank you Annabel for a wonderful week. We are so glad you enjoyed your holiday is our apartment. We hope you will visit again soon. Westward Ho! is a seaside town a few miles from Bideford and ten miles from Barnstaple, North Devon's main town. Westward Ho! 's main attraction is the ten mile beach which gained 'blue flag' status five years ago. It is host of a range of water and beach sports such as surfing, windsurfing, sand yachting, kite flying and of course swimming to name just a few. The North Devon coastal footpath is accessible from the town and not far away are the picturesque villages of Hartland and Clovelly. A slightly longer drive takes you to Exmoor unbeatable for walking, riding, fishing etc. Famous coastal towns such as Lynmouth, Ilfracommbe and Porlock are also found there. Westward Ho! has all the usual facilities such as supermarket etc. and it has many pubs and restaurants serving good fresh food and the fish and chips are excellent. Instow and Barnstaple have a variety of restaurants and for those seeking something special, The Masons Arms, on Exmoor (michelin star) is well worth the journey. Deposit of 50% of total price to be paid to secure booking. The balance is due eight weeks prior to arrival. For bookings arriving within eight weeks payment must be made in full. Only Saturday to Saturday bookings is accepted for high season. Short breaks minimum of three nights are accepted at other times of the year, last minute short breaks may also be available. Payments are not refundable. If cancellation occurs the owner will endeavour to re-let the property and if this is possible the cancellation fee will be refunded minus £75 to cover administration. We recommend that you take out holiday insurance in case of cancellation. Bank charges are the responsibility of the holiday tenant. Thank you.